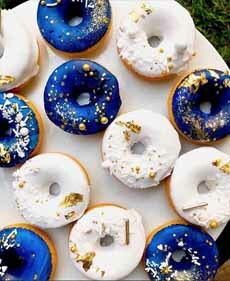 Gold glitter on donuts (both photos courtesy Fancy Sprinkles). Glass rimmers, available in every color in the rainbow. 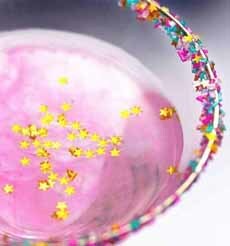 Here’s a holiday gift idea for a baker: edible fancy sprinkles from Fancy Sprinkles, a well-named company. Yes, it’s a bit of a niche product, but the right person will be tickled pink [sprinkles], or any colors you bestow. Each is a beautiful mix of colors and shapes: not your mother’s sprinkles! The company has done a great job of putting together colors and shapes. Everything is mixed to order. The sprinkles are conversation-starter—so if conversation wanes at Thanksgiving, sprinkle the gold, orange and white Pumpkin Spice collection over the pumpkin pie or the rim of your pumpkintini. Individual jars are $5 and up, depending on the complexity of the mix. There are gift-boxed assortments from $15 to $32, and a “sprinkles club” with a different assortment each month, seasonally-themed.